View our other Promotional Products at Logo.me. Click here for a Free Catalog or call us toll free at (800) 915-3535! 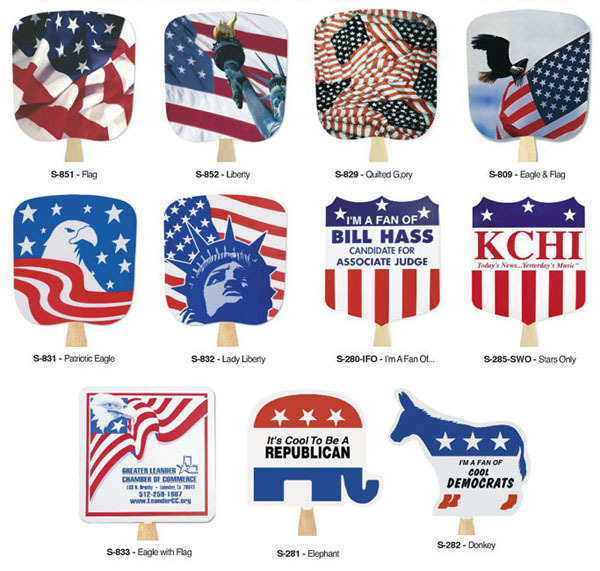 Our patriotic hand fans are perfect for elections, Independence Day, or any other patriotic events. Pass them out for your election candidate and have his or her name everywhere! These custom patriotic hand fans come in several styles including quilted glory hand fans, Lady Liberty hand fans, patriotic eagle hand fans, eagle and flag hand fans, donkey shaped hand fans, elephant shaped hand fans, and much more! For more information on our hand fans, or to learn more about other promotional items, feel free to call one of our friendly customer service representatives at the number above! Price includes stock color graphics on the front and one imprint color on the back. White 18-point board, coated on front. Imprint Area: 7 1/2" x 6 1/4", allow 1 1/4" x 4" in center for handle placement. Price includes your copy imprinted in one standard ink color on front side of the fan in white, open area of our two-color stock fan. Available with stock "I'M A FAN OF", STARS only, EAGLE WITH FLAG, DONKEY or ELEPHANT graphics. White 18-point board, coated on front. Extra Charges: Printing Plate: $37.50 per color, per side. FIRST PLATE FREE with camera ready art. Wooden handles are stapled to the fan, and the staples will appear in the imprint. Add $.13 to have handles glued to fan. PMS color match: $25.00( per color. No PMS charge for standard inks. See list under General Information tab. Union Label: Add 40% net extra to price of fans.